Apple in its recent ‘Show Time’ event at Cupertino HQ made a bunch of announcements that stunned all the audiences and Apple users. 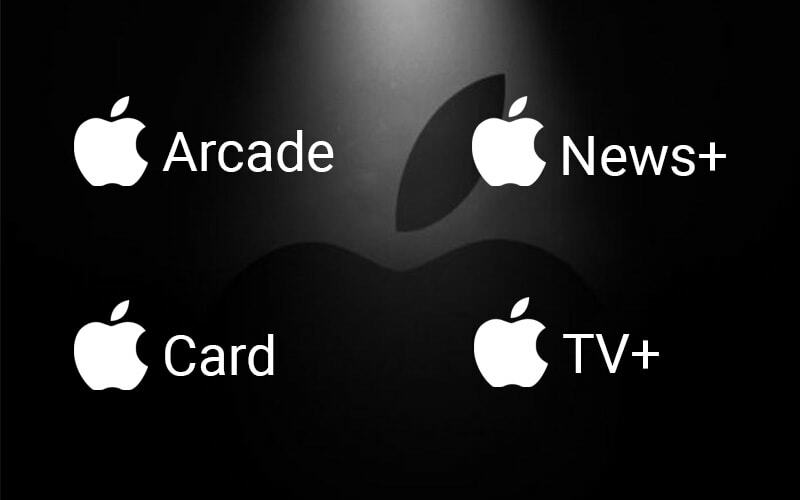 The primary focus of the event was to launch its new Netflix-style media subscription called Apple TV+, Apple Card, Apple Arcade (gaming subscription), and Apple News+, a news and magazine service. It shows that this time, Apple has released interesting services and updates for existing devices, instead of launching new gadgets and software. If you have missed watching the event, here is the recap of the Apple March 2019 updates. Apple is making a debut in the credit card business in partnership with Master Card and Goldman Sachs. The company unveiled a sleek-looking card that promises its users a great credit-card experience without any late or international fees, simpler applications, lower interest rates, and better rewards. The uniquely designed card is a laser-etched titanium card without any credit card number, CVV, expiry date or signature. The users have to simply sign up in their Apple Wallet app and they are sorted to use it anywhere. They can track purchases, check due bills, balances, etc., through the Apple Wallet app. Apple also announced that it’ll use Machine Learning and Apple Maps to label stores that users can use in the app and use that data to track purchases across various categories. Users will also stand a chance to earn 2 percent daily cash on all purchases and 3 percent on Apple products. Roger Rosner presented an upgrade to the Apple News app, the Apple News+ for $9.99 per month, with the first month’s subscription for free. With already too much competition in free news content, this is Apple’s bold play. But it is coming with a lot of exclusive additions. The app bundles both news and magazine publications with about 300 top branded magazines, curated news from leading print publications, ‘Live Cover’ magazine presentation, and digital media platforms. It will also provide a digital subscription to magazines like People, Wall Street Journal, Wired, Vogue, and Rolling Stone. Apple TV+ is like a streaming service which will broadcast original content produced by Apple for TV shows and movies. Set to launch Fall 2019, the Apple TV+ comes with exclusive upgrades with a focus on channels like Acorn TV, HBO, CBS, PBS, and Tastemade without diverting users to a third-party app. Unlike traditional channel packages, Apple TV+ will allow users to subscribe to channels they like and pay per channel. With this service, Apple is trying to rope in exclusive stars and celebrity names like Oprah Winfrey, Steven Spielberg, J.J Abrams, Reese Witherspoon, Jenifer Aniston, Jason Momoa, Kumail Nanjiani and many more to produce original programs that can hopefully stand equally with Netflix’s best shows. Apple’s product marketing manager, Ann Thai unveiled Apple Arcade―the world’s first game subscription service for iOS, Mac OS, and TV OS. Featuring over 100 new games in offline and online mode, Apple Arcade is all set to redefine the gaming experience by imparting creativity, fun quotient, and appeal to all age players. Apple is collaborating with top gaming content creators from Lego to Disney and will launch it in more than 150 countries through App Store. Unlike Google’s cloud gaming services, Apple Arcade is subscription-based, which can be easily downloaded from the App Store. That’s all from the biggest announcements made at Apple Event March 2019. We hope this article has been useful for you to know more about Apple’s new launches and announcements. A whole new series of entertainment awaits for Apple users in 2019. IT Modernization – Gear up for the disruptive changes! React/ RedUX not dead yet – Build modern front-end applications easily! UX or UI – Which one is better for the next design project? Design Thinking: A popular tool for the digital future!